In the latest comparison test by the TEC Institute, solar modules from various providers were tested on the basis of their performance in the event of low solar radiation. 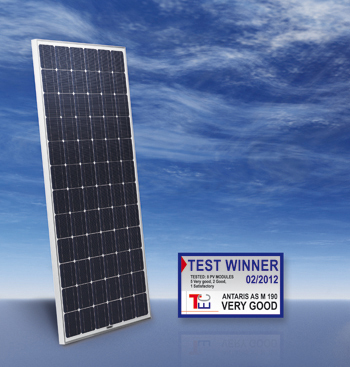 The ANTARIS SOLAR AS M 190 module achieved the highest energy yield per individual module and therefore prevailed as the test winner. For the large range of photovoltaic modules available, objective performance tests and product comparisons provide valuable guidance with regard to product selection. With the monocristalline AS M 190 module, ANTARIS SOLAR participated in a long-term study by the TEC Institute for Technical Innovations in which modules from eight different providers were tested on the basis of their performance in the event of low solar radiation. Good performance even in the event of low solar radiation is decisive for achieving an optimum annual yield, especially in regions with large seasonal variations in solar radiation. With a yield of 265.8 kWh/kWp, the monocristalline AS M 190 module from ANTARIS SOLAR supplied the highest energy yield per individual module and, rated as “very good”, emerged as the test winner. Four module types from other providers were close behind the AS M 190. The comparison test took place between 1 September and 30 November 2011. During this period, the sun was very low in the sky at the test location in Germany, with the global radiation being considerably lower than in the summer months. To conduct the test under real conditions, the modules were installed on a roof. The modules faced due south with an angle of inclination of 30 degrees so that there was no shading. The modules tested were connected in separate strings, each of two or three modules of the same type, depending on the module voltage and the MPP voltage of the inverters. One inverter was used for each string. It was also ensured that the cable length of the test strings was as consistent as possible. In addition to the module power, the weather conditions (temperature, air pressure, wind, precipitation, humidity) and the global radiation were measured throughout the entire testing period. This alignment of the weather situation and the module yield performance enabled objective assessment of the actual energy yields of the tested solar modules.